The operation was carried out with help from the Criminal Assets Bureau and the Cyber Crime Unit. GARDAÍ SEIZED A large amount of cash and property, froze bank accounts and arrested a man following raids targeting the activities of insurance “ghost brokers”. As part of an ongoing investigation into the activities of insurance ghost brokers, gardaí the special investigation unit DMR Traffic conducted a number of searches yesterday morning. Six bank accounts with amounts in excess of €200,000 were also frozen. A man in his 30s was arrested in Lucan and is currently detained under Section 4 Criminal Justice Act 1984 at Ronanstown Garda Station. Essentially, a ghost broker is a person or entity that is not authorised to sell insurance to the public and whose activities are not overseen by the Central Bank. They are acting illegally by pretending to be an insurance broker. The insurance company Aviva welcomed the garda action, saying that the company would work with gardaí to prevent innocent people being the victims of fraud. “We want to acknowledge the excellent cooperation from the Special investigation Unit attached to Garda Traffic Bureau,” said Rob Smyth, head of fraud at the company. “Their extensive investigations corroborate our concerns that “ghost brokers” are active in the Irish market and accumulating significant wealth from their criminal activities,” he said. We believe today’s action by the Gardaí will act as a deterrent to others active in this area of crime. Anyone looking to buy insurance is advised to research their provider carefully and ensure they are dealing with an approved broker. Email “Cash, cars, imitation firearm and high value watches seized in Garda raids targeting 'ghost brokers'”. 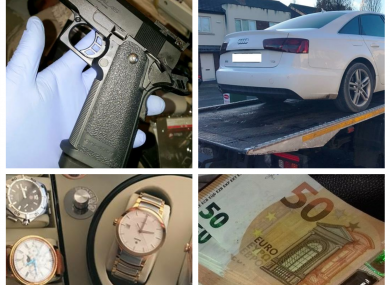 Feedback on “Cash, cars, imitation firearm and high value watches seized in Garda raids targeting 'ghost brokers'”.